Broadcaster Gerry Ryan was last night lauded as a mould-breaking phenomenon of the Irish airwaves after being found dead in his Dublin apartment. The 53-year-old father of five was discovered on the floor of his bedroom in the Upper Lesson Street ground-floor flat he moved into after splitting with his wife Morah. Gardai are investigating the cause of death but do not believe it was suspicious. A post-mortem examination was due to be carried out after his remains were removed from the central Dublin apartment at around 4.20p.m. yesterday. A Garda source said there was no evidence of anything suspicious at the scene when officers were called after Mr Ryan could not be contacted. Claire Duignan, managing director of RTE Radio, said the broadcaster complained of being unwell last night and told colleagues he did not think he would be able to do his show this morning. "When he spoke with people to say he wouldn't be in today, they obviously expressed concern and asked did he need a doctor or anything like that," she said. "But he said no, he was fine, but he wouldn't be in today." A Garda source said Mr Ryan last spoke with colleagues at around 10.30p.m. on Thursday. Tributes poured in for the outspoken "shock jock". President Mary McAleese described him as a "larger than life persona who entertained and enlivened a national audience over many years." Taoiseach Brian Cowen said Mr Ryan was one of the greats of modern Irish broadcasting on both radio and television. 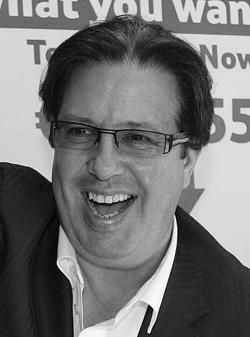 "As a broadcaster, Gerry Ryan was both informed and intelligent, forthright and articulate," he said. "As a man, he was generous, famously irreverent and witty." One of Ireland's best known broadcasters, Dublin-born Ryan anchored his eponymous popular chat show on RTE's radio station 2FM for more than two decades. Before joining RTE in 1979, the often controversial DJ spurned a career in the law, for which he studied at University College Dublin, to cut his broadcasting teeth in pirate radio. His irreverent, iconoclastic and often brash style quickly secured his reputation as a motormouth "shock jock" and he was eventually given his own mid-morning talk radio show on 2FM in 1988. Mr Ryan went on to become a household name, with a daily audience of more than 300,000 listeners. He has also hosted several television series including Secrets, Ryantown, Gerry Ryan Tonight, Gerry Ryan's Hitlist, Ryan Confidential and Operation Transformation. In 1994 Mr Ryan co-presented the Eurovision Song Contest with former newsreader Cynthia Ni Mhurchu. The broadcaster announced the separation from his wife Morah in March 2008 after 26 years of marriage. In a statement, RTE said Mr Ryan's family were in "complete shock" and had appealed for privacy.